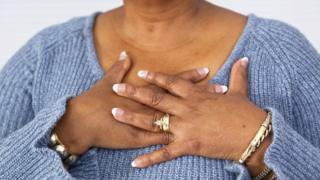 Fewer women who suffer a heart attack would die if they were given the same treatments as men, a new study found. Researchers analysed the outcomes of 180,368 Swedish patients who suffered a heart attack over a 10-year period. They found women were three times more likely to die than men in the year after having a heart attack. The British Heart Foundation said: "Heart attacks are often seen as a male health issue, but more women die from heart disease than breast cancer." Researchers at the University of Leeds and the Karolinska Institute in Sweden analysed data from Sweden's online cardiac registry. They found women were on average less likely than men to receive the recommended treatments after a heart attack. Prof Chris Gale, of the University of Leeds, who co-authored the study, said this is because: "There's misconception amongst the general public and healthcare professionals about wh at heart attack patients are like. "Typically, when we think of a heart attack patient, we see a middle-aged man who is overweight, has diabetes and smokes. "This is not always the case; heart attacks affect the wider spectrum of the population - including women." In one specific heart condition, women were 34% less likely to receive procedures which clear blocked arteries, such as bypass surgery and stents. They were also 24% less likely to be prescribed statin medication, which helps to prevent a second heart attack, and 16% less likely to be given aspirin, which helps to prevent blood clots. This is despite guidelines suggesting all three treatments should be given to both genders. The study found that when women did receive all the recommended treatments, the gap in mortality between the sexes decreased in almost all circumstances. Roughly 124,000 men and 70,000 women are hospitalised for heart attacks in the UK per year. Prof Gale said that from their very first point of contact with healthcare professionals, women are less likely to receive the same diagnostic tests, leading them to be 50% more likely to be initially misdiagnosed. "That then feeds the whole pathway of care," he said. "If you missed the first, earliest opportunity for care - you're much more likely to miss the next point of contact - and it all adds up cumulatively and leads to a greater mortality." The study also found that women were more likely to suffer from other illnesses, such as diabetes and high blood pressure, but these did not fully account for the diff erence in mortality. While this analysis uses Swedish data, the researchers argue that the situation for women in the UK is likely to be worse as more die from heart attacks and there is greater variation in how care is delivered. "Sweden is a leader in healthcare, with one of the lowest mortality rates from heart attacks, yet we still see this disparity in treatment and outcomes between men and women," added Prof Gale. Prof Jeremy Pearson, of the British Heart Foundation, said: "The findings from this research are concerning. "We urgently need to raise awareness of this issue as it's something that can be easily changed. By simply ensuring more women receive the recommended treatments, we'll be able to help more families avoid the heartbreak of losing a loved one to heart disease." Former Trump aide Steve Bannon backtracks on remarks he made about the US preside nt's son.